Get out of town with these interesting Bangkok side-trips: Ayutthaya (Wat Phra Sri Sanphet, Wihan Phramongkhon Bophit, & more), Chitbeer (in Pak Kret) and Ancient City (in Samut Prakan). Spend the 30th (Thu) wandering through the wild on a nature and wildlife tour. Dedicate the 2nd (Sun) to wine at some of the top wineries in the area. 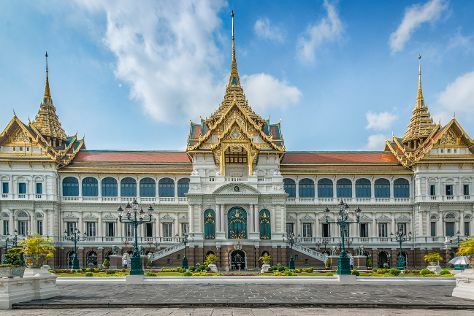 Next up on the itinerary: step into the grandiose world of The Grand Palace, contemplate in the serene atmosphere at Wat Pho, examine the collection at Jim Thompson House, and get a taste of the local shopping with Chatuchak Weekend Market. For traveler tips, ratings, more things to do, and tourist information, read Bangkok travel planner . If you are flying in from United States, the closest major airports are Suvarnabhumi Airport, Don Mueang International Airport and U-Tapao International Airport. Expect a daytime high around 96°F in May, and nighttime lows around 81°F. Finish your sightseeing early on the 2nd (Sun) to allow enough time to travel back home.